Balancing is hands-down the most important maintenance task you can complete to make sure your system is working at maximum efficiency while keeping your home comfortable. Balancing your HVAC system also improves energy efficiency by improving air circulation and delivering proper airflow to each zone. While we always recommend calling the number one provider of Houston AC repair—we also like to educate our customers in case they want to take a hands-on approach to some of their HVAC needs. Air balancing is a procedure that is relatively simple that ensures each zone maintains a temperature true to what is set at the thermostat rather than being 2 or 3 degrees hotter or cooler. This process is simple but may involve some modifications to your existing HVAC system in order to assure even air distribution. These modifications can vary in complexity—some can be done by any average person others require the tools and expertise of a skilled Houston AC repair technician. Step 1: Set the thermostat to 76°-78° and leave it that way for 24 hours—this is an ideal range to test. Step 2: In rooms or areas that are too cold, adjust the vents in small increments and leave for 24 hours. Step 3: Check the impact of the adjustments and if still too cold, repeat this process until you get the desired temperature consistently. If this quick, three-step process doesn’t do the trick, then move on to a little more in-depth methods that can be done without calling your preferred Houston AC repair company. This is a very simple but effective solution—the damper blade is easily adjusted from the outside of the vent cover. It can restrict airflow to different levels in a room. Adjustment is done by trial and error however never close the damper blade fully as this could bring other HVAC issues. If you live in a two-story home, open the second-floor vents all the way and close the first-floor vents halfway. During the winter simply reverse the process. This is specifically for those of you with two-story homes that use two-thermostats. Set the two thermostats within two degrees. For example, if the first floor is set to 72°, set the second floor to 74° or vice versa. Typically, since heat rises you would set the second floor to a cooler temperature than the first. This process will help balance out uneven temperatures. Improves Quality Of Air – When you clean the gunk and debris build-up on your filter, it aids not only with the flow of the air but the quality of the air—keeping a lot of microbes out of the air your breathe. Increases Furnace Efficiency – When airflow is restricted, it can cause your heat exchange to overheat and shut off prematurely for safety. A clean air filter allows more airflow thereby helping to increase the efficiency of your furnace. Extends System Life – You might be surprised to know that the reason most commonly cited for HVAC failure is a dirty filter. A dirty filter forces the system to work harder which makes it overheat and that causes breakdowns due to motor stress. Reduced Energy Costs – Heating and cooling your home is the largest portion of home energy costs at just over 40% of the average utility bill. If your filter is clogged it will use more energy and spiking your bill. When you change the filter regularly as suggested by all Houston AC Repair companies—you can shave from 5-15% from your utility bill. Over time those savings really add up. Windows that don’t have drapes or blinds etc. will heat up a room quicker than your thermostat has time to react and cool the room down. When you add window coverings, you not only make a difference in the efficiency of your system but the visual appeal of the room too. During the warmer months, about 75% of sunlight through even double-pane windows converts into interior heat. Those blinds do a lot more than add privacy. Never place your thermostat next to sources of heat. That could be a window, a piece of electronic equipment, a fireplace, or any other source of heat. This can give false readings to the thermostat and cause it to react accordingly rather than to the actual ambient temperature of the house. When decorating a house, it is easy to forget about leaving open space for vents and not placing furniture in front of them. When you place a bookshelf, a sofa or another piece of furniture over a vent it makes the system work harder. Vents work best when they can have continuous unblocked airflow. Even putting furniture a little too close but not on top of the vent can cause an obstruction—we recommend about 18 inches of space between furniture, curtains or other objects and your air vents. However, if the obstruction is unavoidable, you can install deflectors that re-direct the air away from whatever is obstructing the default airflow direction. These can be installed by Houston AC Repair companies such as Airteam. Once you have tried all of the DIY fixed to try and balance your system—you may find it is still not balanced properly. In that case, you will need to call Airteam so we can go a bit more in-depth using special tools and methods by our certified Houston AC repair technicians. 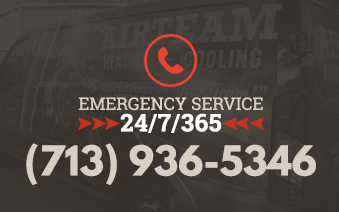 At Airteam we go to bat for you to get the best possible performance out of your system at a reasonable price. Contact us today to get your system running right.